Realtors Warn Metro Denver Housing Market Is "Now Pulling Back In A Big Way"
Home sales in the metro Denver region collapsed in September, forcing sellers to heavily discount asking prices which boosted inventory of properties available for purchase at an unprecedented rate, according to the Denver Metro Association of Realtors (DMAR), as per The Denver Post. "The housing inventory and home price adjustments are normal and expected," said Steve Danyliw, chairman of the DMAR Market Trends Committee, in the report. "What’s not normal? Sales of single-family homes priced over $500,000 dropping 33% from August to September. For those sellers, that’s real turbulence." "The number of single-family homes sold in September, across all price ranges, dropped 30.5% from August and is down 21.4% compared to September 2017. Condo sales fell a dramatic 42.9 % on the month and are down 17.3% year-over-year," said The Denver Post. For years, millennial buyers in metro Denver were plagued with the lack of affordability. When home sales dropped in September, the Denver Post notes that very little buyers showed up. The inventory of condos and homes available for sale at the end of September shot up to 8,807, an increase of 7.04% from August and about 16% move y/y. The median price of a single-family home in metro Denver declined to 3.8% from August to $428,000 but remains up 6.1% y/y. Condos, which are popular with millennials, continued to show gains, as its median price rose 1.73% to $301,625 last month and is up 12.8 YTD. Most of the carnage hit the luxury end of the market. Sales of those homes worth more than $1 million collapsed 44.4% between August and September. Last month, Bank of America rang the proverbial bell on the US real estate market, saying existing home sales have peaked, reflecting declining affordability, greater price reductions and deteriorating housing sentiment. The report was published by BofA chief economist Michelle Meyer, who warned: "the housing market is no longer a tailwind for the economy but rather a headwind." "Call your realtor," the BofA report proclaimed: "We are calling it: existing home sales have peaked." 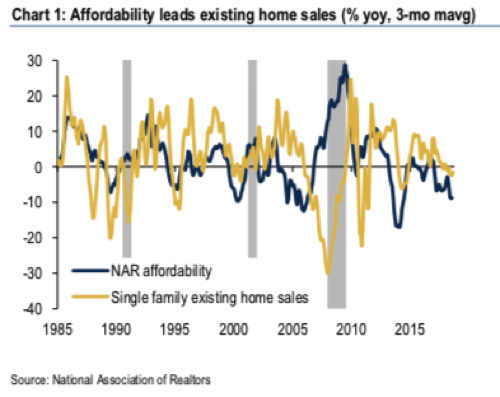 Chart 1 shows there is a leading relationship between the trend in affordability and in home sales -- a simple regression suggests the lead is about three months. In major cities, affordability continues to be a significant problem for many Americans amid a rising interest rate environment and elevated home prices, existing home sales should remain under pressure for the foreseeable future. Chart 2 indicates that the share of properties with price discounts is on the rise, suggesting that sellers are unloading into weakening demand. 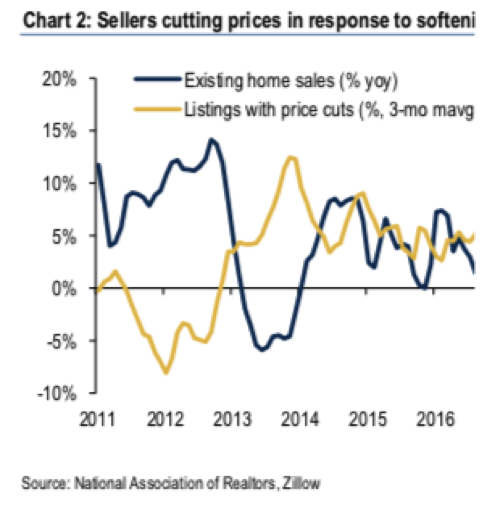 The data from Zillow reveals that 15% of listings have price reductions, the highest since mid-2013 when home sales tumbled last. The University of Michigan survey reveals a worsening mood in the perception of buying conditions for homes. Respondents noted that home prices have become too high while rates have become restrictive. 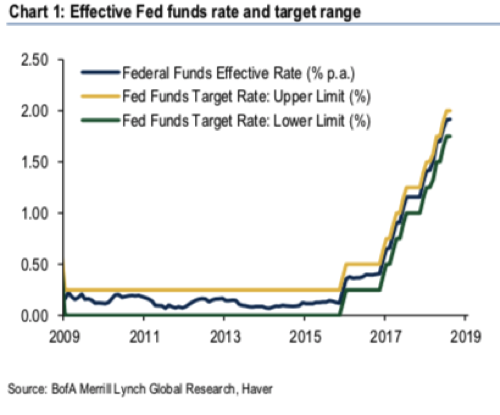 While BofA makes clear the housing market is starting to stall, the Federal Reserve is conducting quantitative tightening and rapidly increasing interest rates to get ahead of the next recession. In other words, liquidity is being removed from the system and the cost of borrowing is headed higher - an environment that is not friendly to real estate and could be the key factor explaining the weakness in metro Denver housing and abroad.